The state-owned petroleum company of Trinidad and Tobago (Petrotrin) says there’s was “a viable market for Guyana’s oil”. GEORGETOWN – Trinidad and Tobago has been making an all-out pitch to refine Guyana’s oil, insisting that such a move would be in best interest of CARICOM. Vice President, Refining and Marketing at the state-owned Petroleum Company of Trinidad and Tobago (Petrotrin) Astor Harris told Demerara Waves Online News there was “a viable market for Guyana’s oil” at Petrotrin and the company had the capacity to refine Guyana’s crude oil to deliver a quality that should match the West Texas Intermedia valuation standard. Harris’ comments are in direct contradiction to a recent statement from former Trinidad Energy Minister Kevin Ramnarine who said Petrotrin would not be in a position to refine Guyana’s oil when commercial extraction begins in 2020/2021. He explained that Petrotrin’s refinery is configured to refine heavy to medium crude, but Guyana’s reserves have been defined as light, sweet crude. “It is possible that some of it could be used as a diluent to dilute some of the heavier crude in Trinidad, but I don’t think the refinery diet in Trinidad is what you all [Guyana] want. 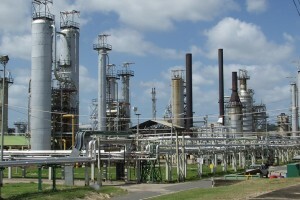 There could be scope for configuring the refinery to refine light crude, but upgrading the refinery to do that will require money and Petrotrin is strapped for cash. So I think the immediate best bet would be to refine that crude in the US, which is what I think Exxon is going to do in the beginning,” Ramnarine told Demerara Waves Online News. Harris, however, signalled that Port of Spain was not about to surrender the opportunity, declaring that Trinidad had a “major interest” in ensuring that Guyana was successful. He explained that if Guyana’s oil is refined in Trinidad, it would allow Petrotrin to use its excess capacity. According to Harris, Petrotrin has a refining capacity of approximately 168,000 barrels per day and it refines 150,000 barrels per day. “So there is room for Guyana’s oil,” he insisted. Acknowledging that the remaining capacity was just 18,000 barrels a day, he stressed that Petrotrin could make necessary adjustments by varying its intake and reducing the amount of international oil. “There is room for the Guyanese oil. We will just reduce and optimize how much we take from the international market,” he said. So serious is Trinidad and Tobago’s bid that Prime Minister Dr Keith Rowley headed to Texas on Tuesday to meet with top Exxon officials and other energy companies including BP Amoco and Shell. A statement from the Prime Minister’s Office said the discussions centre around strategies for navigating the challenges facing the energy sector and opportunities for growth and partnerships in Trinidad and Tobago and in the region.